President-elect of the USA Donald Trump has been associated with a network of Kazakh businessmen who subsequently financed controversial football deals and faced trial in Turkey in a trafficking case of suspected underage Russian prostitutes, according to new revelations from Football Leaks. This comes after Trump last month congratulated the president of Kazakhstan Nursultan Nazarbayev - widely viewed as a dictator - for his fantastic success and called his 25-year leadership a “miracle”. The President-Elect was a close partner of Kazakh-born Tevfik Arif, a developer of the Trump SoHo through his company Bayrock, which appeared to be financed by controversial mogul Alexander Mashkevitch, who made billions from businesses in Kazakhstan. But following a series of legal fall-outs, Trump distanced himself from Arif. Meanwhile the two major Bayrock developments - the Trump SoHo in New York and Trump Fort Lauderdale in Florida - ended in foreclosure. In the late 1990s, former economist in the USSR Ministry of Commerce and Trade-turned businessman Tevfik Arif moved between Turkey and the USA, using his access to vast amounts of cash to invest in the New York real estate market. Tevfik himself was also a developer of the luxury Rixos hotel chains in Turkey and his family had acquired the Aktyubinsk Chromium Chemicals Plant (ACCP) in Aktobe, Kazakhstan. The plant is the only producer of chromium-based chemical products in the country and, according to a 2002 NATO Science Committee report, is responsible for pouring toxins into the local water supply, rendering it undrinkable. In 1996, Arif started out his American adventure with the purchase and redevelopment of a waterfront shopping center in Sheepshead Bay, Brooklyn - in the centre of the borough's Russian community. This was followed by three more condominium projects nearby. Arif went on to found Bayrock in 2001. This was to grow massively in the years leading up to the crash of 2008. In half a decade, the company stated that, through its affiliated entities, it had made investments in transactions comprising real estate assets valued in excess of 2.5 billion USD. Bayrock wanted to enter the top echelons of the US property boom and expand into the dynamic Russian real estate sector. But it needed a big name to lend the company weight. It also craved for a strong brand for major projects in Arif's speciality - the hotel sector. The firm had the equity, but lacked the namecheck. The top individual who could help with this expansion was Donald Trump. American real estate was booming in the early 2000s. Bayrock already had an office in Trump Tower on Fifth Avenue, where Arif operated with a convicted felon, Felix Sater. In 1991, Sater was a broker at Bear Stearns when he entered into an argument “over a girl” with another broker, which ended with Sater smashing a Margherita glass and plunging the stem into the face of the other man. He was convicted to jail for a year in 1993. But he was to keen to put this - and other offences - behind him and remake himself as a property magnate. Bayrock's campaign literature boasted that it has a strategic partnerships with the “most prestigious firms worldwide”. Top of the list is The Trump Organisation - next to a huge photo of Tevfik Arif and Donald Trump. The financing for Bayrock came from strategic partners such as the Icelandic investment fund the FL Group, which allegedly came with backing from companies from the ex-USSR, and entrepreneur Alexander Mashkevitch, according to a presentation document. The company bragged that Mashkevitch controlled five billion USD in estimated sales through his Eurasia Group, a Kazakhstan-based company with interests in aluminum, chromium, coal, construction and banking. The company boasted that it developed seven luxury waterfront resorts on the Mediterranean Sea. These properties included the Rixos Hotel in Belek, Turkey - an assemblage of villas, luxury suites and a golf course. At this luxury resort in 2010, Arif was suspected of ordering his staff to solicit underage “models” as young as 15 from Russia. Later that year, this police sting operation also caught Tevfik Arif and Alexander Mashkevitch on board a luxury yacht moored at Antalya, Turkey with business friends and nine Russian “models” - some of whom were teenagers. Mashkevitch never faced trial, and Arif was later acquitted, but members of his entourage still face possible further sentencing. After his conviction for assault, Sater was involved in a stock fraud. But he enjoyed Government protection for informing on the mob for the FBI. This meant he could conceal his criminal past when soliciting bank loans for his projects. But in 2004, the Bayrock Group began receiving what would become ten million Euro in equity contributions. In the 2010 complaint cited above, a confidential informant told the plaintiffs that this money came from Arif's brother in Russia, “who had access to cash accounts at a chromium refinery in Kazakhstan”. Tevfik's brother, Refik, was the one who built up a massive business from the sale of chrome-based chemicals in Kazakhstan at the ACCP factory, criticised by the NATO report. The industrial chemicals were sold to top western brands such as Procter & Gamble and BASF. The complaint alleges that Bayrock Holdings LLC is a “mere conduit hiding that source“. Later Refik Arif financed a company overseen by his nephew Arif Arif (who is Tevfik's son), Doyen Sports. This London-headquartered management firm develops the commercial and image rights of sportsmen such as David Beckham, Boris Becker, Usain Bolt and Neymar Jr. But Football Leaks has revealed the constellation of firms in the Doyen universe feature shell companies in Malta and the United Arab Emirates, vast secret commissions to assist with player transfers, false billing and backdated contracts signed by frontmen. One example is here. For two years, whenever Bayrock ran out of cash, the holding company would “magically show up with a wire from 'somewhere' just large enough to keep the company going” adds the complaint. Without this cash from Kazakhstan, Bayrock “could not have turned the lights on”. In 2005, while Bayrock was receiving mysterious money, Arif and Donald Trump began working on projects together. The masterpiece was to become the 46-floor apartment complex - Trump SoHo - where each unit cost over a million dollars to build. Arif told magazine Real Estate Weekly that success stems from surrounding yourself with the right people, which included Donald Trump. “He's been very helpful to us from the beginning and he's been very helpful in opening some doors. The strength of the relationship is: we do what we do best – and we're very active in what we do – and Trump does what he does best,” Arif said. Arif’s ambition in 2007 was to bring the luxury of Manhattan to the less illustrious NYC boroughs. “As Kennedy said, 'Some men see things as they are and say why? I dream things that never were and say why not? '” Arif told the magazine. With Trump, Bayrock was now helping to develop the Trump International Hotel & Tower, Ft. Lauderdale and Trump International Hotel & Tower Phoenix. But the ambitions did not stop at the borders of the USA. Trump and Arif had grand plans. They aimed to expand the Trump brand to Moscow, Istanbul, Kiev and Warsaw - possibly even the Crimean resort of Yalta. Deals which Trump called “phenomenal”. Arif was going to open the doors for Trump's east European invasion, and give Trump up to 25 per cent interest, management fees and a potential percentage of gross income in the projects. Trump did not even need to put up cash. All he had to do was to lend out his name. New York City's Trump SoHo, which is actually just west of SoHo, was planned to be an apartment block. But zoning restrictions and a fierce battle from local campaigners such as the SoHo Alliance, forced him to transform it into a condominium hotel, where buyers stay for part of the year and rent their apartments for the remainder. 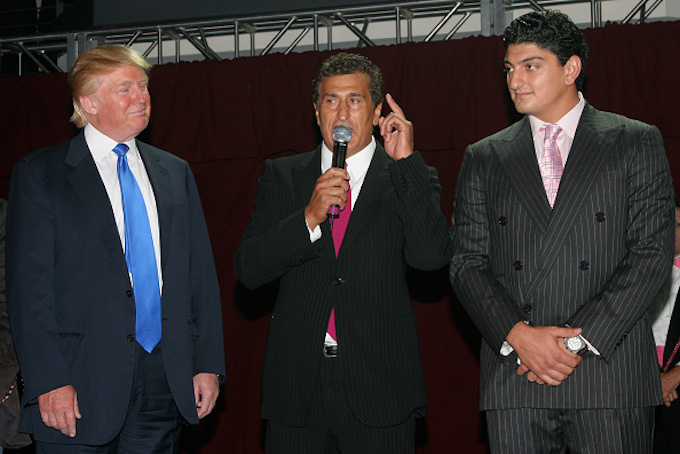 Arif and Trump's partners in the project were Tamir Sapir (Temur Sepiashvili from Georgia, now deceased) and his son Alex Sapir, whose Sapir Organization has owned millions of square feet in Manhattan. “Tom [Tamir] and Alex came to us with a complete proposal. We looked at it, and we loved it,” Trump said at the time. While the Sapir organisation owned the majority of the property, Trump admitted to owning around 18 per cent, in a 2007 deposition. “After many years of work with The Trump Organization on various projects, we are delighted to be delivering the Trump standard of luxury and lifestyle to SoHo,” stated Tevfik Arif. The President-Elect was not shy to advertise this property - even though the source of cash for Bayrock was mysterious. A magazine advertisement featured Trump’s daughter Ivanka in a cocktail dress, under the tagline 'Possess Your Own Soho'. An advert for the property was broadcast in the finale of Trump's reality TV show 'The Apprentice' in 2006. The construction of Trump SoHo saw controversies. The bones of possible 19th-century slaves were discovered at the site, where an African Methodist Episcopal church had stood until 1963. On 14 January 2008 A Ukrainian worker on the 44th floor of the site, Yuriy Vanchytskyy, was preparing to pour concrete into a wooden mold that doubled-up as a floor, when the mold collapsed. Cement and work materials plunged down, together with Vanchytskyy and a second worker. The Ukrainian missed the safety net and fell 42 stories to the second floor - where a jutting piece of metal decapitated him. Bragging became the undoing of the project. In September 2007, Trump claimed the 400 units had received 3,200 applications and his daughter Ivanka Trump told Reuters in June 2008 that 60 per cent of the units were sold. The Trump SoHo opened on 9 April 2010. A symbol of uber-gentrificiation for a bohemian zone. Soon buyers realised that only just over 15 per cent of the property was purchased. On 2 August 2010, a group of these buyers filed litigation in the Manhattan Federal District Court against the project’s developers, including Bayrock and Arif. They stated groups and individuals behind the project had inflated sales figures in the first 18 months of marketing. They wanted their contracts rescinded, their deposits returned and were seeking damages and fees. On 2 November 2011, ten of the buyers, including French footballer Oliver Dacourt, received a 90 per cent refund on their deposits following this suit. By 2014, the developers had sold less than one-third of the 391 units. The property faced foreclosure. Now it is a hotel that still uses the Trump name. In 2007, Trump believed his deals with Bayrock were falling apart because of negative publicity from writer Timothy L. O'Brien and his book 'TrumpNation; the art of being Donald' and a sister article in the New York Times. The book claimed that Trump's net worth was 150 to 250 million USD, rather than the two to five billion USD, that Trump had boasted. Trump brought a lawsuit against O'Brien, which was heard in December 2007. Trump claimed he lost seven deals as a result of the book which downgraded him from billionaire status and tarnished his global standing as a property genius. He also believed he lost Bayrock's mega-Trump tower deal in Phoenix because of the book. “I believe that without this book you probably would have had the zoning completed,” he said. Plus, he claimed a project in Moscow with Tevfik Arif fell through because of the expose. For this deal, his closest associate was Tevfik. The idea was for a Trump International Tower and Hotel in Moscow, Kiev, Warsaw and Istanbul - and Arif gave Trump access to these deals. Bayrock knew the investors and Trump believes they were friends of Arif, although he could not remember at the time who they were. Under the deals, Trump would have a 20 to 25 per cent ownership interest. He did not need to invest anything. But then the new revelations came out from O'Brien. It seemed the Russian investors wanted nothing to do with Trump anymore. In 2008, the financial crash struck the global property market. Bayrock was victim to the hit. Its mega-projects ended in foreclosure, the company was sold off, the investors were angry - and only the lawyers saw a profit. Disaster 3: Bayrock "mob-owned and operated"
In a 2010 complaint, the structure of the Bayrock group was laid bare - and the findings were ugly. Ex-finance director of Bayrock, Jody Kriss, claimed the subsidiaries of the Bayrock Group embezzled millions of dollars, defrauded the Internal Revenue Service and extorted money through threats of torture and death. He filed litigation against Bayrock, its directors and corporate affiliates, including Arif. The complaint alleged that Sater took eight million USD from Bayrock, Schwarz four million USD and Arif 15 million USD. The cash came “from crime rather than legitimate profit”. They evaded up to 20 million USD of their tax liabilities. There is no evidence Trump took part in, or knew about, this racket. Under fire was a complex 2007 deal with the FL Group, an Icelandic firm, which culminated in Bayrock and FL becoming co-developers. The 'Icelanders' came with 50 million USD and intended to form a partnership to develop Bayrock's giant Trump projects. The complaint alleges the Bayrock bosses disguised FL Group as a “lender”, not a partner, to pretend the 50 million USD was a non-taxable loan. Thus the firm could avoid paying millions in tax. When Kriss objected to the FL Group scheme, the complaint states that Sater “made him an offer he couldn’t refuse” - either take 500,000 dollars, keep quiet, and leave all the rest of his money behind, or make trouble and be killed. The Icelandic company, FL Group, was identified in a Bayrock investor presentation as a “strategic partner,” along with Alexander Mashkevitch. But who was behind the FL Group? It was based in Iceland. Are we talking about Icelandic investors? It's not that simple. Founded in 2005 by “corporate viking” Hannes Smarason, the fund bought and the sold stakes in low-frills airline EasyJet, and also owned a third of the Iceland-based Glitnir bank - the first finance group ofits kind to collapse in the crash of 2008. After the disaster, the fund changed its name to Stodir and still had affiliates linked to Bayrock in 2014, but lost them that year to foreclosures. But it appears the group was funded by Russians. During the early negotiations between FL Group and Bayrock, the real estate group was approached by Novator, an Icelandic competitor of FL, which promised to enter into the same partnership with Bayrock as FL was contemplating, but on better terms. “Arif and Satter told Kriss that this would not be possible," states the complaint, "because the money behind these companies was mostly Russian and the Russians behind FL were in favor with [Russian President Vladimir] Putin, but the Russians behind Novator were not, and so they had to deal with FL." Disaster 4: Florida Collapse: buyers were "misled"
Bayrock and Trump's 200 million USD luxury condominium in Phoenix never happened, due to local opposition to the project's height. They announced and then cancelled another Florida project called Trump Las Olas, and together pushed an unsuccessful venture in Colorado. But they did manage to construct the Fort Lauderdale project of 298 condominium hotel rooms over 240,000 square feet. Trump pulled out of Fort Lauderdale in 2009, when the developers stopped paying him a monthly fee for the use of his name. Arif himself exited from Bayrock in the same year. However a similar case to Trump SoHo was filed by buyers at Trump International in Fort Lauderdale in 2010. The suit alleges that buyers were misled about Donald Trump’s involvement in the project. They also complained that the project, which began in 2005, was plagued by delay. In December 2010, a 24-page ruling from Judge Adalberto Jordan at the Southern Florida District Court noted that “sales literature ballyhooed the building as a profitable investment allowing a favorable income share“ and promised the building would be finished in 2007. It also alleges that the marketing campaign promoted the building as an elite “Trump Property,” which Donald Trump and his company, Trump Organization LLC, were developing. The Trump Organization denied that anyone was misled - and claimed Trump was only licensing his name to the project. According to the Miami Herald, more than 100 people lost millions in the high-rise. By 24 December 2012, lawyers for Bayrock were doing everything possible to keep Arif off the lawsuits brought by investors in the collapsed project, Football Leaks has found. Eventually, the property defaulted on a 139 million USD loan. It was sold in March 2012 in a foreclosure auction - and is now preparing to reopen as the Conrad Fort Lauderdale. These disastrous ventures point to a lack of judgement from the now-President elect in the business partners with whom he chose to associate for his signature projects. The future leader of the free world was not available for comment. Tevfik Arif ceased control of Bayrock in 2009 due to the depressed real estate market and the difficulty obtaining finance to fund luxury projects. During the boom time, the costs of funding were low and deals could happen fast. “The landscape has completely changed and [Tevfik's] interests have shifted towards emerging markets,” his son Arif Efendi stated in Football Leaks. We wanted to ask Tevfik Arif questions about these and other issues. But through their lawyers, the family told the European Investigative Collaborations and partner Der Spiegel that: "Essential parts of your questions are based on untrue assumptions and/or concern issues, which are protected by the personal rights of the named persons." Meanwhile Trump had his own plan for the emerging markets. Trump Towers Istanbul, two conjoined glass and steel hulks, opened in 2010, with 200 residences, a shopping mall and a wine cellar with space for nearly 17,000 bottles. The property developer was Turkish billionaire Aydın Doğan, in a license-partnership with Donald Trump. The future President's surname is emblazoned in neon at the summit of the construction. But now this faces a new kind of controversy. In June 2016, Turkish President Recip Tayyip Erdogan called for the removal of Trump's name on the towers, due to the mogul's prejudice against Muslims. Trump had called for “a total and complete shutdown” of Muslims entering the United States in December 2015. After Arif snubbed Trump back in 2007 due to his bad press, Trump later returned the favour by claiming he was not that close to the Kazakh. When he sat for a deposition in a lawsuit in November 2013, he stated that he had almost no interaction with a man who was going to be key to launching the Trump brand in the former Soviet Union and Turkey.